Nepal Tour is a leading company that specializes in package based as well as tailor made tours across Nepal, Tibet & Bhutan along with car / coach booking. Visit Nepal with us and explore all that the rich Nepal heritage has to offer. Get ready for a breathtaking journey taking you from historical monuments, cultural markets to the mystical mountains, exotic wildlife sanctuaries. 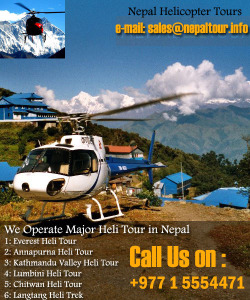 We arrange complete Nepal tours for you, from start to finish. Besides we arrange air ticketing, luxury helicopter tours, business travel, group meetings, group accommodations, car rentals, city tours and much more, at very affordable cost. Nepal Tour has made inventive accomplishments in the field of tours, travel, and tourism, in short complete bouquet of tour and travel all needs.